POUGHKEEPSIE, N.Y. – While people all through Florida state have been forced to evacuate their homes and find shelter anywhere else, for Marist senior Luke Langston he was thinking about going right into the eye of the storm. Already far away from the danger but fearing for the safety of his home, the temptation to make the drive all the way from Poughkeepsie, New York back down to Miami, Florida lingered in his mind. With their house on a marina there was increased fear that the water would rise and damage their home, so they needed to act fast. With no relatives near their Miami home, Langston’s brother at school and parents out of the country, he looked to his family to see if he should make the drive. After a conversation with his mother the decision to drive down was nixed and they decided to call a team to secure the interior of their home, as well as the boat on their dock of the marina. With the fear that their home could still be damaged, the best Langston and his family could do was hope their home would withstand the storm. Friends of Langston who stayed in Miami posted photos of the desertion, the streets that normally held such life were empty, as though the busy city had become a ghost town. With the storm approaching quickly Langston remained on edge, checking with friends and neighbors on the status of his childhood home. After the storm the most surprisingly message he received was in regards to the sky, “…I was amazed by how peaceful and calm the sky was after. It was a bright and sunny day with no clouds…” But to eye level the damage on the streets had no words. 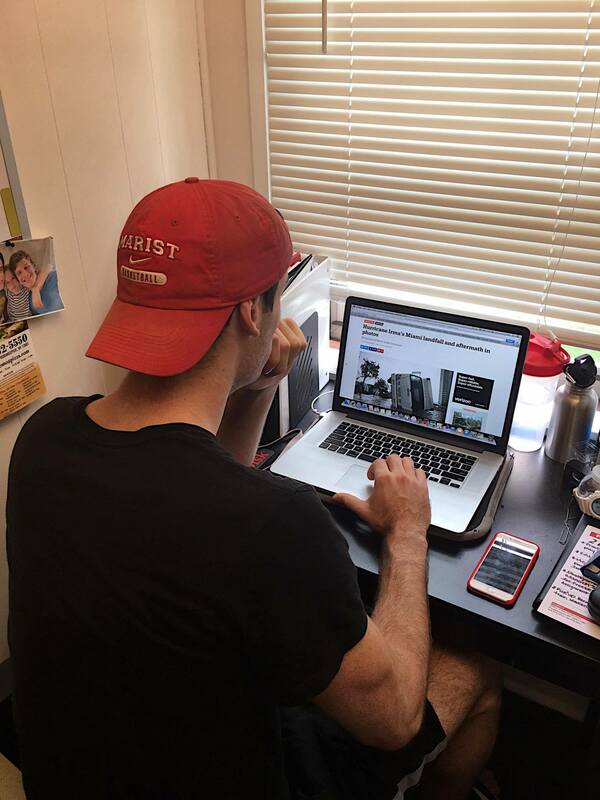 Photo of Luke Langston researching damage to Miami, FL. After the storms passing Langston had learned from his parents that six trees had fallen within his home’s property, and the dock that their boat was on was still intact. In regards to damage on the inside of the house or to the structure itself, at the moment it appears that there wasn’t any. For the rest of Miami residents, particularly the Lower Keys, the 130 m.p.h. winds leaving an estimation of 50 to 60 billion dollars worth of damage, and they were still unable to go back to their homes. Destruction from this storm has left sewage, electrical grids and water systems down and in need of repair. In a report of the Miami Herald Allen Douglas, executive director of Florida Engineering Society commented “Monroe and Dade County definitely have the strongest building codes in the country when it comes to the wind and water…We’re hopeful, when all the assessments are done, we’re going to find the codes stood the test.” Moving forward citizens are being updated on the nature of their homes and will hopefully return soon. In the mean time for students like Langston the best way to handle the situation is to stay in touch with family, and hope for the best.